Week 3 – What would you dedicate your life to? I sit completely still, staring into the warm, chocolate brown eyes of a woman I don’t know. I feel awkward and embarrassed. I want to look away. But I’ve come here to this workshop to be challenged, to be a student instead of a teacher. I’m hoping to meet new parts of myself. So I stay focused on her eyes even though I feel vulnerable and exposed. I take a deep breath and ready myself to share my soul with a stranger. The teacher gives my partner her instructions. For the next five minutes she is to repeatedly ask me the following question while remaining silent each time I answer. 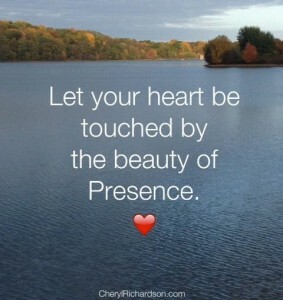 What does it feel like when your heart is touched by beauty? The moment I hear the question, I smile. I’ve spent the last year and a half focused on beauty. I’ve walked the beach for miles, collecting seashells, taking pictures, and reveling in the sound of crashing waves. I’ve sat for hours in fabric stores looking for just the right shade of peach. I’ve spent countless afternoons in nature amazed by swans and trees and light on leaves. And I’ve found deep satisfaction in the beauty of well-written words contained in books I now have time to read. I can answer her question without hesitation. I feel happy, truly happy, I reply. I feel at peace, like all is well with the world. She looks directly into my eyes, a smile slowly gathering at the corners of her mouth. I can feel her heart open, preparing to catch every drop of what I have to say. What does it feel like when your heart is touched by beauty, she asks again. I feel alive, I tell her, as if joy has taken over my body and there’s nothing more in the world I need. Nothing. I feel blissfully full. Again: What does it feel like when your heart is touched by beauty? I tune in deeper. Tears fill my eyes as I remember how, for so many years I relegated my need for beauty to the periphery of my busy life – a special treat only to be consumed once the “important” things were handled. Now beauty has become my life. It feels like being in complete alignment with my soul, I explain, like I’m doing and being exactly what I’ve come here to do and be. I stop for a moment, allowing the weight of this statement to land in my chest like an anchor. Yes, that’s it, I say out loud to this friendly stranger. I’m here to honor beauty, to embody the healing power of the Divine Feminine in all that I do. As I share this truth, I see her eyes fill with tears. Instantly we become soul sisters. When it’s her turn, I ask the question and sit still as she offers her answers. I look deeply into her eyes with presence and love. After a while, she stops answering. Tears silence her voice. Take your time, I tell her. Tears are a rare form of beauty. A form I happen to love. She collects herself and as words tumble from her lips, I discover that this angel woman has recently embarked on the same journey. She’s been traveling the world looking for someone or something to give her permission to honor her soul’s need for beauty. I smile a big, toothy grin at the perfection of the Universe. She’s come to the right place. Just then, the bell rings letting us know the exercise has come to an end. We’re told to simply say thank you and return to the group. We stop for a moment to stare at each other, grateful eyes communicating without need for words. I’m here to honor beauty, to embody the healing power of the Divine Feminine in all that I do. Today, as I came across this entry written after the workshop, I was happy to be reminded of this message. I want to stay connected to the promise of that day, to what I choose to honor with my life. What are you here to honor? This week’s video is about a four-legged angel. You can watch it here.